Although in modern times, we usually think of Northwest Native plants in terms of beautifying our gardens and landscapes, many have been used for hundreds of years for practical purposes such as food, herbal medicines, household uses. Here are some of the ways these plants can be used to enhance our daily lives. We do urge greatest care in identifying any plant that is to be used as food or medicine. There is often more than one plant with similar characteristics and a mistaken identity can be deadly! Also, be sure the plants you harvest for any use in the home are free of pesticides and harmful chemicals. Just as with any plant that is brought into your living space, remove any uninvited hitch-hiking bugs. 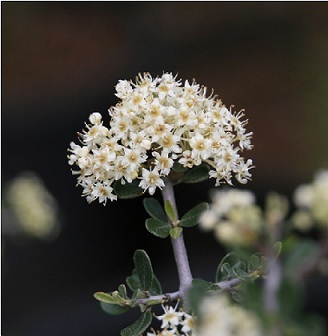 Ceanothus cuneatus (Buckbrush): Quietly beautifying a corner of the landscape, who would guess this lovely northwest native shrub is enriching the soil for itself and all those in the immediate vicinity. All the shrubs in this family offer their natural ability to fix nitrogen in the soil. Learn how helpful this can be on the Ceanothus page. Most of the ways to use northwest native plants that we list on these pages have been handed down from Native Peoples who were the first to discover which plants could be used for which purposes. They shared what they had learned with early settlers, and in fact still hold the keys to bringing the beneficial qualities of native trees, shrubs and perennials into our lives. Some plants have historically been used in day-to-day living, some have been held sacred for ceremonial values. Always, the Original People have been careful to preserve the wellspring of each plant that is used so their origins are not depleted. We must share this care for our earth. It must be understood that, in today's large populations, plants to be harvested should be grown for that purpose. Plants should not be gathered in the wild. Those wild plants are for the enjoyment of us all. Plants we take for our own uses should be grown and nurtured, as are other crops. When you choose a site and prepare the planting place for your northwest native huckleberry or your Salmonberry, consider how delightful it will be to pick those berries and put them on your cereal in the morning or bake them in your pie. Tend them carefully and teach your children to enjoy them as well. What a luxurious feeling to pick a few Northwest Native strawberries on an early summer afternoon right in your own garden!